Lately you’ve been feeling so over the subway. So why not float into the Halloween party in a light pink bubble? Having a crown is grand, but being in possession of a magical wand...well, you could do a lot more good than to make sure your commute is easier. 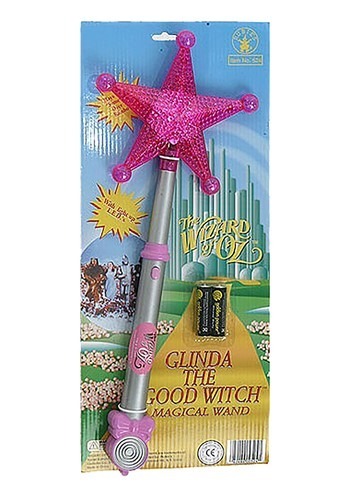 This Light-Up Musical Glinda Wand features LED lights and plays a pretty version of "Somewhere Over the Rainbow,” so waving it around will undoubtedly turn your whole night into a more magical and adventurous celebration. Plus, who doesn’t want to be a good witch? You get to help people, make dreams come true, and probably eat a lot of chocolate (we’re just guessing). So find a sparkly white gown (we know you have one hanging around your closet for just such an occasion) and tip a tiara into your curled and springy locks, lovely, because whether you follow the yellow brick road or take the M train, this wand will imbue your voyage with whimsy.